People in most countries of the world continue to get fatter and unhealthier every year due to an increased consumption of processed junk foods. Yet, more scientific knowledge and human effort is being put into promoting healthier foods than ever before. The organic food market is the fastest growing segment of the food industry in the United States. Support your local vegetarian restaurants, organic markets, and health food stores – they’re working hard to improve your quality of life. Anamaya – Southern Nicoya Peninsula – Yoga retreat and boutique hotel with organic food. 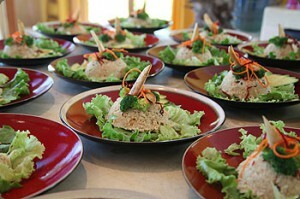 The chef also does raw, vegan, and vegetarian cooking, with a special focus on “superfoods”. Located in the Montezuma/Malpais area. Cafe Organico – Southern Nicoya Peninsula – Mostly vegan, all organic, this amazing restaurant in Montezuma, Costa Rica is run by Ozlem from Turkey.